A variety of factors influence the performance of photovoltaic system production. System owners want to get the most for their money when they install solar panels on their home or business. In southwest Ohio we want the solar array to face south. The sun rises in the east and sets in the west and peaks in the sky at solar noon each day. While it is possible to mount modules facing east, west or even north the performance penalty increases the further away from true south the array faces. For rooftop mounting on pitched roofs the best approach is to mount the modules parallel to the roof. This provides the best aesthetics, though it does compromise performance to the extent that the roof does not face true south. For flat roof applications there is opportunity to orient the modules irrespective of building orientation, and a variety of commercial mounting systems make this an easy approach. So how much does array orientation effect system performance? To view the graph comparing system performance vs. array orientation click on the following link. The chart shows that if the array faces south + 30 degrees it will still produce 97-98% of the optimal system output. In Figure 1, 90 degrees represents an east facing array and 270 degrees represents a west facing array. As you can see from the chart these extremes reduce the array performance by almost 20%. So south facing arrays work best but if that does not match your roof line there are other options with predictable outcomes. A photovoltaic module works best when the sun strikes it at a 90 degree angle. Most residential and small commercial solar arrays are installed with a fixed tilt (more on tracking arrays later). Since the angle of the sun (as measured from the horizon) changes throughout the year, what is the best angle to mount the modules to maximize system performance? Assuming we have an array which faces true south the following chart provides the answer (for southwest Ohio). To see the graph thaat compares tilt and system performance, click on the following link. The chart shows that for our area, 30 degrees is the nominal tilt angle for a photovoltaic array. If we mounted the array horizontal to the ground or flat we would still achieve 88% of the optimal production and if we mounted the array vertically facing south we would achieve only 58% of our optimal production. Most pitched roofs range from 18 – 45 degrees and these will achieve 95+% of optimal system output. Again for flat roofs the mounting systems allow us to select the angle of tilt for the modules. There are mechanical solar tracking systems available that attach to the panels and track the sun throughout the day to maximize the hours of sunlight. In general these systems add mechanical complexity (read installation and maintenance cost) which in general outweigh the performance improvements. Trackers are typically only being implemented for large utility scale projects. SunRock recently installed a pole mounted system which orients the array to face south and has a hand crank that is turned to adjust the array tilt to follow the seasons. This system improves system performance by approximately 5% annually with no expected increase in maintenance costs. Photovoltaic modules are very sensitive to shading. SunRock performs a shading analysis for each site during the project evaluation and bid preparation. This allows us to provide an accurate estimate of the system’s expected performance. Shading occurs from surrounding trees, buildings, chimneys, dormers, and other structures, so a careful evaluation of the site needs to be performed prior to estimating production data. If you have a yard full of trees and a roof full of shade, then your rooftop may not be a good candidate for solar. There are other options though. 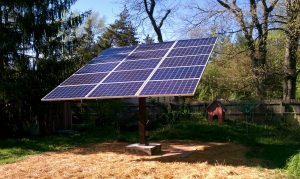 Solar panels can be installed on ground mounts, top of pole mounts, carport structures, etc. For some possibilities check out our project photos. There are also new micro-inverter and DC optimizers which can help mitigate shading issues at the site. These are deployed based upon specific shading issues at the site.